Looking for Entertainment for your Holiday Event? Are you the one tasked with the job to find the right kind of entertainment for you Holiday Event? Of course you are! Think about hiring a Magician! A lot of people don’t think to because they see Magic on TV or on a big stage, and so they think this isn’t really something they can have on a smaller scale. But the truth is, I am readily available Holiday Events for any size and show! Magic is a great option because I can either put on a show, where I am on stage in front of everyone, mingle with the crowd, or the best option… BOTH! That allows me to engage with the guests and they get to know me and see Magic right in front of their eyes and experience it in their hands. Then when I go on in front of everybody, the crowd already loves me and enjoy the show even more! My strolling close-up show titled "Ice Breaker". This is perfect entertainment to include during a cocktail reception. Here’s how it works – People usually arrive to most venues at different times, those that arrive early are sitting around waiting for the event to start as other people start to arrive. During this waiting period I move through the crowd and engage people with some Close-Up Magic. This is perfect for groups of 1-5 people. In many cases a CROWD will gather and from there I can easily transition into a few close up illusions that are perfect for the larger group. As a Special Bonus I will present a customized close-up illusion that will highlight the Holiday Event. With enough notice I can customize a close-up this illusion to say something unique in relation to the Event or your company. This would be the perfect vehicle to deliver a message while keeping everyone thoroughly entertained and most importantly Magically highlighting the event. What about the stage show? 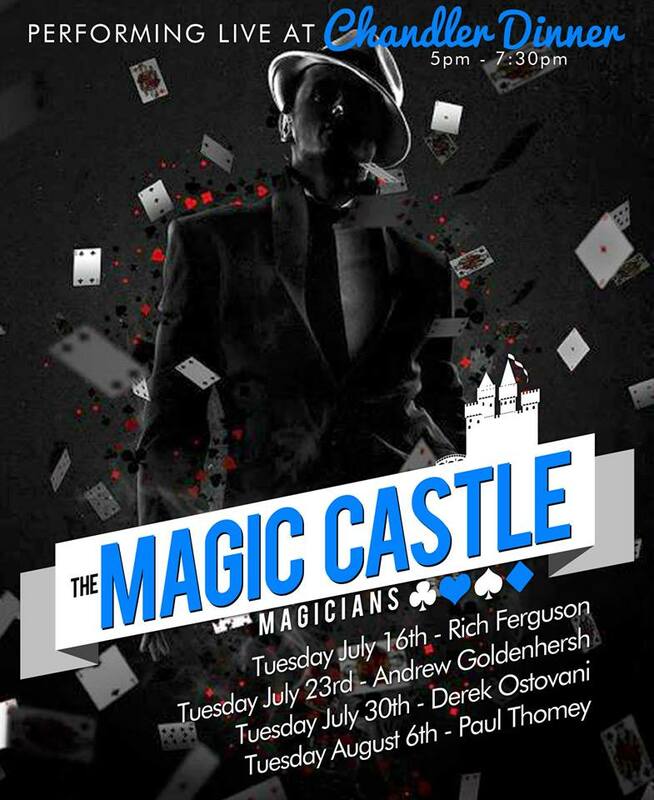 I will perform my Las Vegas style close-up Magic show. This takes place AFTER dinner or at the end of the event and will compliment the rest of the party perfectly. Some people may have to leave and others may stick around, this way everyone has something to do. Here’s what it’s all about. Usually after dinner and the other festivities, there are a number of people asking to see more Magic. This is the perfect moment to perform this specialized presentation. I position myself at a table and people gather around and we have a blast on and off for the duration of the evening. During this presentation the Magic is a little more formal without taking away from the rest of the party. When you choose the combination, it’s like getting two shows! So don’t hesitate any longer, as dates go quick! Reach out today to get your Holiday Entertainment booked to make your Event memorable! Everything you need to know about booking a Wedding Magician! Why do you need a Trade Show Magician? Have you ever been to a trade show? Have you ever been a part of the trade show? How has your Holiday events been so far!? Well personally, I've been to at least 5 or 6 myself! I do a lot of Holiday events every year. Should you be a Mentalist or a Magician? Or is it okay to be both? As I approach this holiday season as a Corporate Entertainer, and my first season as a Full-time professional, I have realized 2 things that seem to counter each other, and here's what I've found. As I grew up, many things took my interest including sports, drawing, and painting. I was a very curious kid who really strived on both science as well as creativity. It wasn't until 2006 when I got accepted to Cal Polytechnic in San Luis Obispo to study Architectural Engineering. It was that same year that I discovered Magic and my entire life changed! I was so enthralled and obsessed with this new found passion of Magic that I literally was contemplating a brand new future. But I am a kind of person to see things through and not give up on things I pursue. So my new goal was to pursue full-time Engineering and Part-time Magic and eventually ween off the Engineering and do full-time Magic! Well, as I graduated in 2010 and moved back to San Diego, I found that finding a job as an engineer with no experience and living in America's finest city was NOT the easiest of tasks. It became rather daunting and discouraging. As I continued to look for work, I kept up my Magic. I continued to perform and book gigs, and things began to snow ball. I started teaching Magic, I became the President of my local Magic Club, and I held court at several restaurants where I was a weekly performer there. Suddenly, I was too busy to give my full time attention to looking for a job in the corporate world because I was too busy entertaining the corporate world. Fast forward 5 years later, I thought to myself, If money was not an issue, what would I do? I thought I wouldn't do engineering. Although I enjoy it for what it is, when you do it full time, you are constantly under the gun and always having to fulfill deadlines and it can be rather stressful. But I thought I would do Magic whether I got paid or not! Right then I was content doing what I was doing. Just a few months later, my mind set completely changed and I thought about the time and money that was spent in school and how long it had been since I graduated. I feared that if I didn't pursue Engineering NOW, that my chance would be lost and I would forever regret it. So once again I got serious about it and looked for jobs, however; this time I didn't limit myself to just San Diego. I thought I would have to look elsewhere in order to find something. I end up finding a company in the Bay area and worked as an Engineer for 3 years. I took 2 exams to lead to becoming a fully licensed Engineer. All while still battling in my head if I should follow my passion. Well the day has come where I have put a stable Engineering job in the past and have followed what truly makes me happy, what I wake up for in the morning. I have a beautiful girlfriend inside and out who one day I will make her my wife! She has been 100% supportive in whatever I wanted to do. She just wanted me to be happy and knew my aspirations will lead to good things. So here's to a job where I am my own man, make my own hours and deadlines, and hold myself responsible for everything! You will never work harder for anyone than yourself! What does 4F stand for?! Good question - Fechter's Finger Flicking Frolic! It is an invite only convention held in Buffalo, NY every April. Flash back... It was last year 2016 when I was at Magic Live, the worlds Largest Magic convention held in Las Vegas! I was doing a signature effect of mine (pictured below) to some fellow Magi. Unbeknownst to me, Obie O'brien who runs 4F was watching from over my shoulder, and as I was done, a hand grabbed my shoulder, I turned and it was Obie - he said, "you fooled the S*&t out of me!!" And right there he cordially invited me to his convention. I was honored. He said I had to get to sponsors, which I was able to have Doc Eason and Eric Jones (current AGT contestant) happily sponsor me. Stay tuned for my 4F experience! So after being in Phoenix and performing in the Market out here, it is time I return home to San Diego and continue corporate entertainment of Magic, Mentalism, and Hypnosis! I shall return back in just a few weeks, and I have already lined up my first show for a private event on Shelter Island, which I'm very excited! See you soon, San Diego!